"This sauce makes for some excellent tasting ribs, but certainly would also be great on just about anything. It's a very basic combination of ingredients that will yield a tantalizingly great flavor." In a medium bowl or bottle, combine the vinegar, ketchup, water, sugar, salt and chili powder. Mix well and store in the refrigerator until ready for use. this is a really quick recipe to make, it was just too thin. And something about cider vinegar doesn't make it taste right with me. sorry! This recipe makes a great base! 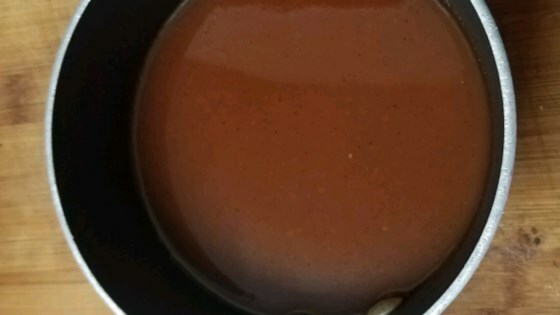 I added a few ingredients to taste, like worcestershire sauce, minced onions, honey and some seasoning salt. This is a really good sauce, and easy to spruce up. I added red and black pepper, worcestershire, red wine vinegar, a bit of honey and onion. Yummy!! Easy to whip up in a hurry! Full of flavor the cider vineger and chili powder add just enough zing! I was out of BBQ Sauce and tried this recipe. Poured it over leftover roast beef. Everyone loved the sandwiches. Had all the ingredients on hand which made it so easy. Highly recommend it.